Silver coins are the investment of choice for anyone looking for silver bullion for sale backed with the trust and assurance inherent in official coins produced by government mints. The 1 ounce American Silver Eagle , for example, represents the ultimate in liquidity and recognizability. The US Mint produced and sold more than 40 million of those coins each year in recent years - making them far and away the most popular coin in the world. The sovereign mints do charge a bit more for minting so premiums are higher than privately made rounds or bars. However buyers can be confident coins will also bring a bit more when it is time to sell. Much or all of the additional premiums paid to get "official government issue" should come back to you later. Silver coins with a high content of this precious metal are used for investment purposes, as a hedge against inflation and to help protect personal wealth. There are also numismatic silver coins people may collect for their historical value or simple enjoyment. Discover more about silver coins and the role they play in our lives yesterday, today, and in the future. Silver coins have a rich history. They are considered the oldest mass-produced type of coin in the world. They have been used for trade since the days of the Greeks. By 612 BC, the Persians were using silver coins as money. As a result, certain ancient and old silver coins have become highly collectible, such as the Miliarense. People also collect silver coins today, such as the more modern Morgan Dollar (although few such items have much value beyond their actual silver content). Silver bullion coins are the investment of choice for anyone who wants silver backed with the trust and assurance inherent in official coins produced by government mints. A lot of the earliest coins were minted in Lydia in Asia in 600 BC. They were created from an alloy of silver and gold called electrum. These stamped pieces of metal quickly became a popular concept in Greece and the colonies near the Mediterranean Sea. Many of these coins were painstakingly produced by hand. Then Greek coins started to be denominated to give them a value in fractions, such as drachmas and staters. China independently created their own coinage system but these coins were made of bronze. Over time, coins in small denominations in the Mediterranean are were also made of bronze. Standards to define the weight and value of coins were created, such as the Aiginetic standard and the Attic standard. Consider how a one cent zinc coin today is made to look like copper while a mostly copper quarter contains nickel to create a silvery finish which implies a higher worth. By the 4th century BC, Macedonia dominated the Greek territories and Alexander the Great attacked Persia. The empire fell upon Alexander's death and smaller kingdoms evolved. At this time, kings issued Greek coins rather than cities issuing them. The concept of a mint to mass produce coins became more popular, though the first mints actually originated in Lydia. With mass production, silver coins, and other precious metal coins were minted as far as Asia and Egypt. Meanwhile, the Romans made their own coins starting in 3rd century BC. 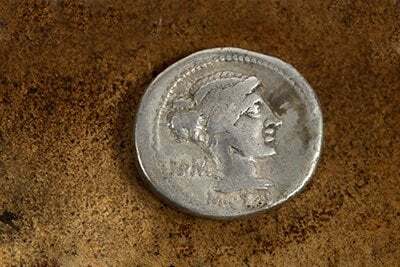 In time, silver denarius coins become the principal coin of the region. In the area of Greece, similar coins were called Greek Imperial coins. Silver coins started to become a standard means of exchange and an efficient store of value. Coins were soon issued by the Celts, the Phoenicians, the Jews and the Carthaginians. They were also produced in areas of the Arab Peninsula and the Iberian peninsula. As regions continued to conquer each other and create new empires, the coinage changed and evolved. In some regions, there were fewer silver coins as more bronze and copper were being used. During the rule of Mughal Emperor Alamgir II in India, punch-marked coins were created. These small bits of silver contains a specific weight and were punched with various symbols. At this time, Persia separated Greece and India. These early coins were a sign of how silver coins would be designed in the future. When the Spanish colonized America after 1492, there were several discoveries of silver in areas such as Mexico, Peru, and Bolivia. Silver began to flow more freely in Spain and Europe. Ultimately, silver coins were transported to Asia. China preferred using silver coins and traded their Chinese silks and porcelain to get them. The abundance of silver in the New World meant mines started to be exploited by the Europeans during the 1800s. Ultimately, larger quantities of silver coins were produced, which lead to inflation. Because more silver was available, the prices started to plummet. Simple supply and demand. Big Government powers and central banks began their assault on silver as money in the late 1800s and continued apace in the 20th centure. Soon, gold also would come under attack, starting with the force expropriation of America’s gold in the 1930s. As a result, silver continued to be used in the manufacturer of circulating currency until the 1960s. Now silver coins are primarily created for collectors or as bullion to sell to investors. Pre-1965 dimes, quarters, and half dollars US coins contain 90 percent silver and their actual metal value is many multiples of their face value. Now these coins are mostly copper and nickel. While pre 1933 gold coins are anywhere from .1209 to .9675 troy ounces of gold, with the remainder being copper, which makes them more durable. Silver is also used for an array of industrial, military, medical, nano-tech, and luxury purposes. From electronics to jewelry to biocides, silver is a vital commodity. People with silver jewelry can check the SKU numbers to determine the silver content. For example, a silver middot necklace with .s925 is worth much more than a silver-plated one. Types of silver coins include collectible coins for numismatic purposes and bullion coins made for investors. Collectible coins are speculative and their value in the market is quite subjective – usually based on age, rarity, silver content, condition, and other less tangible factors. For example, uncirculated silver proof coins are typically in pristine condition and worth somewhat more than ones used as actual currency. In addition to proof coins which are supposedly specially struck, newly minted coins are sometimes called brilliant uncirculated (BU) silver coins. Be VERY careful when considering purchases of any kind of collectible, proof, or commemorative, as they are frequently used to rip off investors and force them to pay way above the coins’ melt value – extra premium which they are often unlikely to recover. The value of silver bullion is based on the current market price for silver. These silver coins are bought and sold in real time and pricing is transparent. The silver content in the coin determines its basic worth. Fine silver has a millesimal number of 999, which can be referred to as pure silver. Most fine silver is 99.9 percent. The remaining small percentage consists of trace impurities. Pre-1965 dimes, quarters, and half dollars are sometimes referred to as “junk silver” coins, coins primarily valued for the silver they contain rather than numismatic value. (But since they are silver, they are anything but junk!) The number troy ounces of silver contained is the basis for the market price of junk coins. Often they are kept in a roll before they are cashed in. Also, there are coins that are referred to as semi-numismatic silver coins. These coins may have a small amount of numismatic value as well as value based on the silver content. Most silver bullion coins minted today contain 99.9% silver. Some of the most common silver bullion coins around the globe that you can buy from Money Metals, include the American Silver Eagle, the Mexican Silver Libertad, the Australian Silver Kookaburra, the Australian Silver Kangaroo, the Canadian Silver Maple Leaf, the Austrian Philharmonic and the Chinese Silver Panda. What is the best silver coin to invest in? Within the category of low-premium bullion coins, it makes little difference which particular coin you pick. Any of the Royal Canadian Mint coins, U.S Mint, or other world mints will do, it will just depend on your preference. Because overall, an ounce of silver is an ounce of silver, regardless of what kind of design, finish, or mint mark it has. Some make the case that U.S. citizens should own American Eagles based on their government guarantee of legal tender value and an implicit exemption from any future silver confiscation order. It’s highly unlikely these concerns would ever come into play, but you can certainly opt for Silver Eagles if you want that extra layer of reassurance. Even though you’ll pay a slight premium over most other bullion coins, American Eagles are still in the bullion category. The important thing is to stay in the bullion category – and not veer into the category of numismatic coins, which carry much larger mark ups over spot prices. Silver rounds are minted privately. They are called rounds rather than coins because they have no face value as currency and they are not legal tender. Usually, silver rounds have a weight of 1 troy ounce of silver or fractions of an ounce. Designs can range from commemorative for the military or other occupations, to holiday designs, and more. Mints can also engrave these items to honor special occasions. Silver coin prices are determined based on the type of coin, its face value as currency, and the content of silver the coin contains. 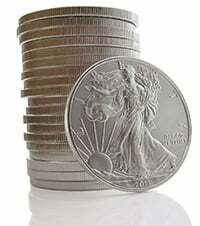 Silver coins minted as currency may ultimately have more value as silver, based on the current market prices of silver. The value of silver is determined by its purity and the weight of the silver coin. A wise investor constantly checks the current market value of silver before agreeing to a buying or selling price. Live global prices and spot price charts are published at MoneyMetals.com. Use trusted resources rather than blogs, eBay, or word-of-mouth. Work with a reputable online dealer like Money Metals Exchange and verify prices in real-time before closing a deal. Silver is traded on the spot market under the abbreviation XAG. In the United States, it is settled as XAGUSD. Silver bullion bars are another way to invest in silver bullion. While coins are usually small and transportable, silver bars come in a variety of sizes, ranging from small to very large and heavy. Silver bars are minted into the shape of a bar for investment purposes. Some investors may store them privately in a home safe, while others might keep them at a bank or with a dealer in a physically segregated, allocated (non-fungible), or unallocated (pooled or fungible) storage facility. Basic silver bar sizes include 1 ounce silver bar, 5 oz 10 oz, 100 oz, 1 kilo, and 1,000 ounces. Silver bullion bars may also be available in smaller sizes. Much like silver coins and other types of silver bullion, silver bars are priced based on their live global spot market price, plus a small premium. People no longer have to travel miles to find a coin shop with silver coins and bullion for sale. Secure online resources, such as Money Metals Exchange, offer silver, platinum and gold mint coins and bars at highly competitive prices. Have confidence buying these items from a reputable industry professional with convenient shipping right to your front door.